What are the Best Workout Routines That are Joint Friendly? Joint pain can be debilitating, cause pain, and deprive you of your mobility. The right exercises done regularly and safely can help to alleviate pain and give you back your independence. Many people assume workouts make joint pain and stiffness worse, but the opposite is true. None or too little exercise can make your joints feel more painful and stiff. Lack of exercise leaves your muscles and surrounding tissue in a weakened condition, and it’s vital to maintain support for your bones. Lack of physical activity weakens the supporting muscles, which creates added stress on your joints. Light cardio or aerobic exercise, such as walking, swimming, and cycling go easy on your joints. Start with the goal of 150 minutes of light exercise per week. If you break up the workouts into 10-minute blocks, it’s easier on your joints. Strength training are exercises that aid in building sturdy muscles that support and protect your joints. Training with weighted objects is one strengthening exercise that can help you maintain or increase your muscle strength. You can do exercises at home using kettlebells, resistance bands or canned food. Don’t exercise the same muscle groups two days in a row. Take a day off between exercise sessions. Rest a few extra days if you're experiencing joint pain or swelling. Two days a week is all that’s needed to improve your fitness. Yoga and tai chi are fantastic ways to gently build up your supporting muscles while relaxing both your mind and body. Stretching the muscles around your joints helps decrease joint compression, and it also strengthens the muscles to help provide more support to your joints. Shoulder rolls: Stand tall with your arms straight and close to your sides. Roll your shoulders forward 10 times, and then back 10 times. Side bends: Place your feet shoulder-width apart, bend your knees slightly, keep your stomach tucked in. Raise your right arm up and to your left over your head. At the same time, slide your left arm down your left leg to your knee. Lean into the stretch. (If you feel pain, you're leaning too far.) Hold for a count of 10. Return to your start position, and then repeat on the other side. Hamstring stretch: Sit up straight at the edge of a chair. Straighten out your left leg in front. Rest your heel on the floor. Gently bend forward at the hips until you feel a mild stretch on the back of your left leg. Hold for 20 - 30 seconds, then sit up slowly. Repeat on the right leg. Apply heat to soothe your joints, loosen up your muscles, and relieve any pain before you start. 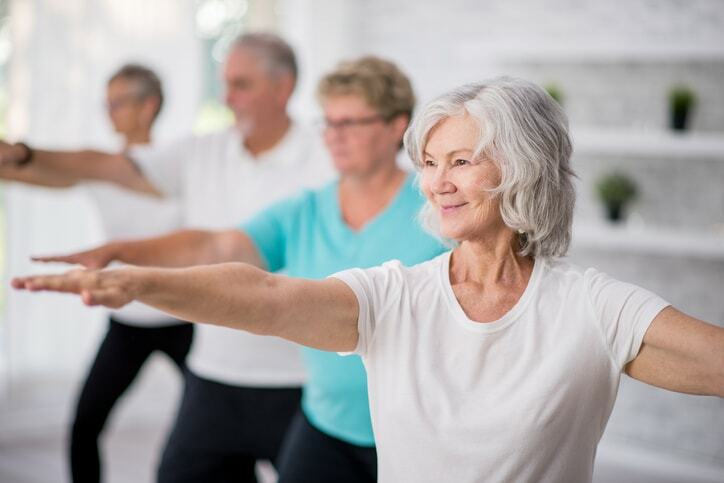 If you’re feeling joint pain, the first step in restoring your mobility and quality of life is scheduling a consultation with an experienced orthopedic specialist. Dr. Peter K. Sculco provides personalized, high quality care combined with first-rate orthopedic training. Call 212.606.1771 today or fill out the form on this page to request an appointment.